How do you sum up a simply spectacular weekend of geeky goodness in one post? I've had varying levels of success trying to do longer, Epbot style, recap posts of DragonCon and this year I'm just saying no. 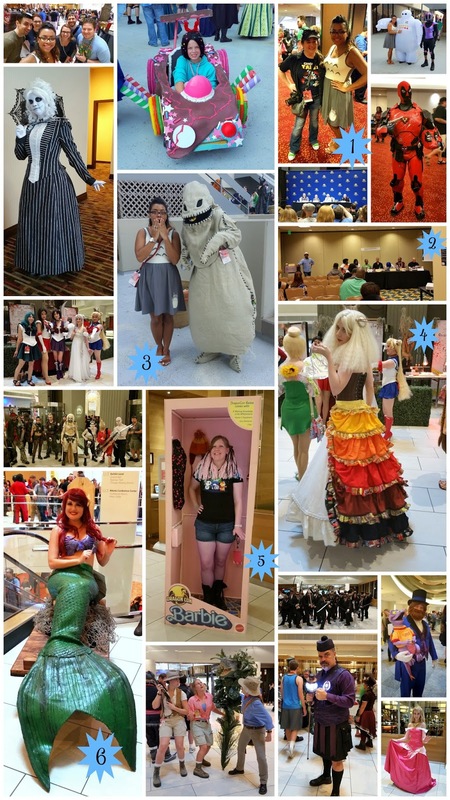 Between today and Thursday I'm going to post a couple collages of some of the best things/people I saw (or that my friends took pictures of) and I hope it gives you a better idea of what makes DragonCon so wonderful. It was an epic weekend and if you get the opportunity to go I highly recommend it. Eight years later and I have absolutely no regrets. 1) Jen from Epbot/Cake Wrecks! Love her and her husband John, so I'm really happy I ran into them a couple times this year. 2) "The State of Black Science Fiction" - one of the best panels I attended this year, and resulted in great conversation about what books are being written/published right now, what books we need, and how people can support their development. 3) Oogie Boogie! This amazing creator took first in the Horror Category at the costume contest. 5) DragonCon Barbie, now with real sound effects! I wish I had room to show more of the angles of this costume because it was so creative and fun. 6) Best Ariel I've ever seen. Hands down. And one of my friends overheard her saying she'd auditioned for Disney before?